Are you waking up tired after hours and hours of sleep? You might think that it’s weird that, even after a beautiful 8.5 hours of sleep, you’re not as rested as you sometimes are. It turns out that it might come down to something called a sleep cycle: 90-minute periods of sleep, during which you shouldn’t be woken up. If you’re woken up after one cycle but before another, you’re going to wake up more rested and less tired. Sleep Time is a free app that, unlike many sleep cylce apps, uses your device’s accelerometer to determine exactly where in a sleep cycle you are, and whether you should be woken up. Measuring sleep cycles like Sleep Time does is much preferable to other sleep cycle apps and webapps, where they’re hard-set to 90 minute periods. Sleep Time uses your phone to determine the exact stage of sleep you’re in, and it wakes you up within a range of time that lets you end a cycle rather than start a new one. If you’re interested in seeing how you slept, that’s something that Sleep Time excels at. It lets you view entire colourful charts of your time awake, time in light sleep, and time in deep sleep, so there’s no lying to yourself how much sleep you got and what time you went to bed at. Sleep Time is definitely worth the minimal effort it might require to switch. 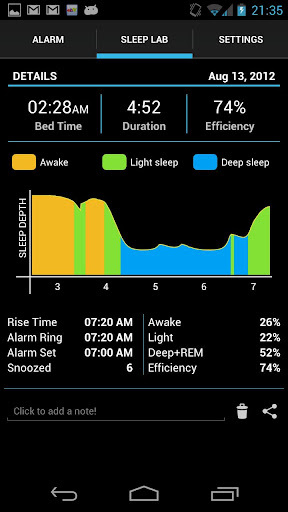 Its scientific alarm function is incredibly useful, and its sleep graphing is almost as entertaining. If you’re not waking up rested, switch to Sleep Time to get a better night’s sleep.